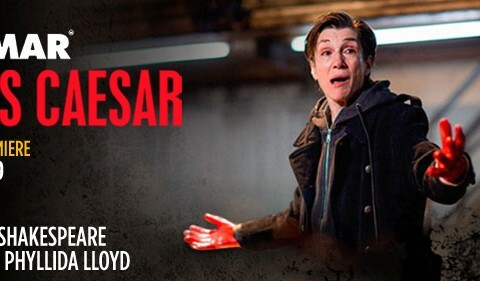 In the hard, grim surroundings of a women’s prison, the all-female actors in Phyllida Lloyd’s bold production of Donmar Warehouse’s Julius Caesar play inmates and guards performing an explosive, arresting production of Shakespeare’s most famous discourse on power, loyalty, and tragic idealism. While all-male productions of Shakespeare’s plays restaged in contemporary settings are common, in the hands of this cast, led by Harriet Walter as Brutus, Frances Barber as Caesar, Jenny Jules as Cassius, and Cush Jumbo as Mark Antony, Shakespeare’s themes are glaringly and touchingly heightened by the backdrop of female incarceration, a live thrash metal band, and the emotional nuances inherent to women playing men at their most vulnerable. Gripping and illuminating. This Julius Caesar generates a higher testosterone level than any I have seen. Blisteringly tense and crystalline. This may be the most thrilling, lucid and authentic Julius Caesar for years to come. The best Julius Caesar I’ve ever seen and certainly one of the top shows of the year. One of the most ferocious, immediate performances of Julius Caesar I’ve ever seen.